Our readings this week covered description and arrangement in digital preservation and challenged the effectiveness of archival principles respect des fonds and provenance for new media, objects. Lev Manovich details how new media objects are essentially databases. Digital objects are a layered collection of items. Users can interact with the same digital object in a variety of ways, meaning the objects lack a linear narrative. Manovich introduces videogames as an exception. On the surface level, players interacting with the game follow a narrative and pursue defined goals. However, Manovich goes on to clarify that to create a digital object is to create “an interface to a database” and that the content of the work and its interface are actually separate. Even while playing a video game, which seems to follow a narrative, players are only going to points mapped out by the database creators. The database nature of new media objects contrasts the narratives often provided by analog objects, meaning new methods for describing and arranging digital objects are needed. Owens provides the 4Chan Archive at Stanford University as an example of using the MPLP approach for digital objects. The archive is available as a 4 GB download, an example of quick and easy access. Stanford opted to include limited but informative description, including the scope of the collection and metadata for the format, date range, and contributor. Owens also states that digital objects are semi-self-describing due to containing machine-readable metadata. Owens uses tweets as an example. Underneath the surface, tweets contain a lot of informative metadata, such as the time and time zone. In an effort to describe Web Archives, Christie Peterson tested Archivists’ ToolKit, Archive-It, DACS, and EAD. Peterson found that the “units of arrangement, description, and access typically used in web archives simply don’t map well onto traditional archival units of arrangement and description.” Discussing Archive-It, Peterson describes the break-down of the tool. Archive-It uses three categories: collections, seeds, and crawls. An accession of a collection of websites would be a crawl. Peterson found that there were no good options for describing a crawl. She could not say what the scope of the crawl was or explain why certain websites were left out. This means current tools and methods leave archivists unable to document their activity, creating a lack of transparency. Owens defines original order as “the sequence and structure of records as they were used in their original context.” Original order maintains context and saves time and effort from being spent reorganizing and arranging content, leading to faster access. However, maintaining original order can be difficult for digital objects. Jarrett Drake asserts that provenance is an “insufficient principle” for preserving born-digital and socially inclusive records due to its origins rooted in colonialism. The provenance principle asserts that records of different origins should not mix. The principle became popular in the United States in the early 20th century, when few were able to own and control their records. When it comes to digital objects, Drake states “the fonds of one creator are increasingly less distinct from the fonds of other creators.” He provides the example of Google Drive, which allows multiple people to collaborate on document creation. Another change in the times that affects provenance is the rise in people who are able to create and own their records. Nowadays, people are able to name and describe themselves. According to Drake, archivists should support this and name creators in archival description according to their self-assertion. According to Owens, using community-provided descriptions is becoming popular. To create the online exhibition The Reaction GIF: Moving Image as Gesture, Jason Eppink asked the Reddit community for canon GIFs and descriptions of them. Eppink wanted to mark what GIFs meant to those who used them and getting the description directly from the community enabled him to do that. Our readings also assert that, when dealing with multiple copies, it’s easier to keep all of them. As Catherine Marshall states, “Our personal collections of digital media become rife with copies, exact, modified, and partial.” One copy may have better metadata, another better resolution, and so on. We have so many copies that the “archival original” is decentralized and not straightforward to determine. Marshall states that it is better to keep these copies than delete them. This is due to people having too many copies, storage being so cheap, and people not knowing which copy they’ll want in the future. Our readings lately have been asserting the value in allowing communities to describe their records. In chapter 7, Owens points out that giving description over to the end user can “easily result in spotty and inconsistent data.” How can archives maintain a balance between empowering communities and keeping quality, consistent data? What are your thoughts on permitting anonymity in archives? Do you think that it’ll lead to doubt over the validity of the record later on? How can archives demonstrate truthfulness in a record while protecting the creator’s identity? In each stage you have what I’ll call “lifelines”. There is the “Consult Charter” which brings you to highlighted passages from the Instructions for Virginia Colony, 1606, and there is “Ask a Colonist” which is somewhat like phone a friend. 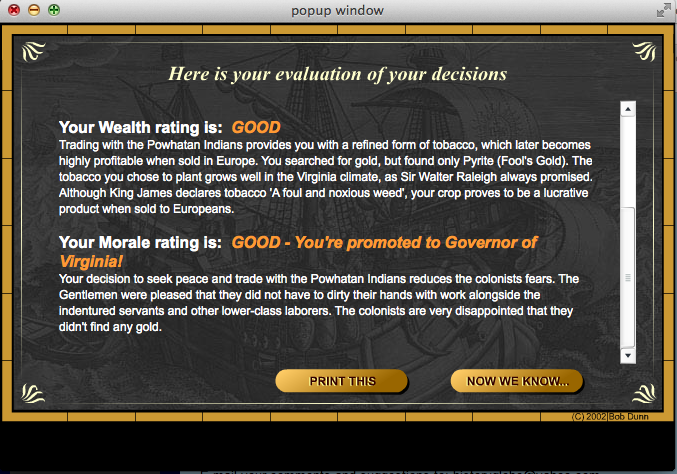 This option though, represents the mindset of the typical seventeenth-century colonist and does not give you the benefit of hindsight. Also, for some stages, you can “Ask a Native” as well. The Native point of view is pretty moderate, but there are some parts where her answers are relatively useless. For example, when you’re trying to determine whether to build a town, wood fort, or stone castle, she answers her people live in a village, which does not really point you in any direction. What is interesting is as you play different scenarios, you discover your “options” become more limited at times. For example, if you say only indentured servants have to work, not gentlemen, your labor force become cut in half and you can only search for one out of: gold, fishing, hunting. If you make the gentlemen work, you get two options. Same applies with where you choose to land. If you land on a river, bay, or ocean, you can choose to fish. If you land inland, your options are limited to searching for gold or hunting. This took me a few rounds to discover the different ways your choices change later stages, and I wish there was something included that would say earlier and overtly what the consequences were. When you follow the choices the original colonists did, you wind up being promoted to Governor of Virginia. What is interesting though is even the “right choice” or “best choice” can lead to bad results for your settlement. For example, when choosing where to land, both the Charter and Colonist point you towards the Bay Marsh (which is where the original colony was). This is strategic because it allows you to fish, but also is not on an island or unprotected area where Spanish warships can attack. However, in the conclusion of the game, your health rating is poor because the marshy area led to an outbreak of malaria, and the wood fort hindered good sanitation. 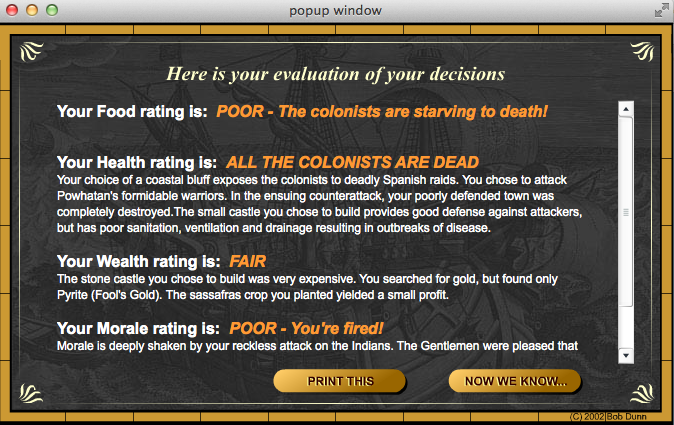 In one round, I chose the absolute worst decisions for my colony, and in the end I had a great wealth rating, but bad health one as all of my colonists were dead. Literally. Overall, what I like best about the game is that it gives you analysis of each choice you make, not just a pass/fail (or live/die) outcome. The game really gives you insight into the positives and negatives of each choice you could have made. 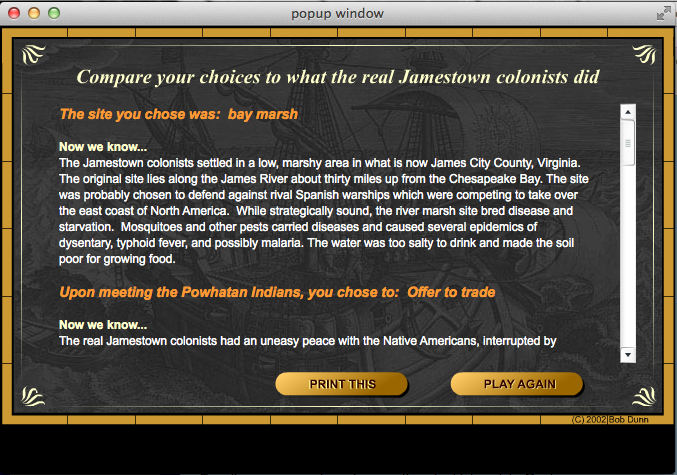 The biggest contribution of this game is that there was no “right path” that Jamestown could have followed. On certain things they chose poorly, others pretty well, and yet there was no perfect solution. My digital project will address the abolition debates in the colony of Rhode Island in the period leading up to the American Revolution. While the state of institutionalized slavery in the South and the bloody fight of the American Civil War are well known in our collective public memory, slavery in the North is widely forgotten by the historical narrative. This project will help to fill a gap in public knowledge about the history of slavery in the United States. I would like to present this information in an interactive format. Because we learn so much about slavery and the causes of the Civil War in the American educational system, I would like for this digital tool to stand out against other educational aids on similar topics. Further, I would like for this resource to be able to reflect the differences that were inherent between the state of slavery in the North and in the South. In order to present this information, I will focus on the lives of two prominent Rhode Islanders, John Brown and Moses Brown. The Brown brothers entered the slave trade together. However, a horribly tragic end to their first slaving voyage caused them to follow different paths. John stuck with the slave trade and rose to wealth and prominence with his profits. Meanwhile, Moses’ eyes were opened to the questionable morality of the trade and he fought to outlaw both the trade and the institution from the colony. I would like to create an interactive adventure game that allows players to follow the lives of John and Moses as a fictional younger sibling. As a sibling, players will be given the opportunity to join John and Moses at the critical junctures in their careers, both separately and especially at the places where they cross. Players will be familiarized with the historical progression of the move to abolition as well as the function of slavery and the place of the slave trade in Rhode Island during this time period. My intended audience for this project is teachers and students. The game itself will be designed for an elementary aged child. I think that this type of interactive adventure is educational and exciting for this age group. It allows learning, while providing a contrast for the more traditional methods of addressing history in an educational setting. In order to reach this audience, I would like to market to teachers specifically at Rhode Island public schools. I would like to explore the possibility of it being connected to a more well-known organization in the state, such as the Rhode Island Historical Society, in order to reach more teachers. Ideally, I would like to evaluate the project through teacher feedback. In the short run, I would like to explore the possibilities of doing a trial testing of the game with teachers in the local DC area. I know that we haven’t gotten to the weeks on historical web games yet, but I was googling around just to see what kind of games might exist on the topic of my beloved hometown and I found a series of very simple games for kids presented by the Chicago Historical Society (now the Chicago History Museum). 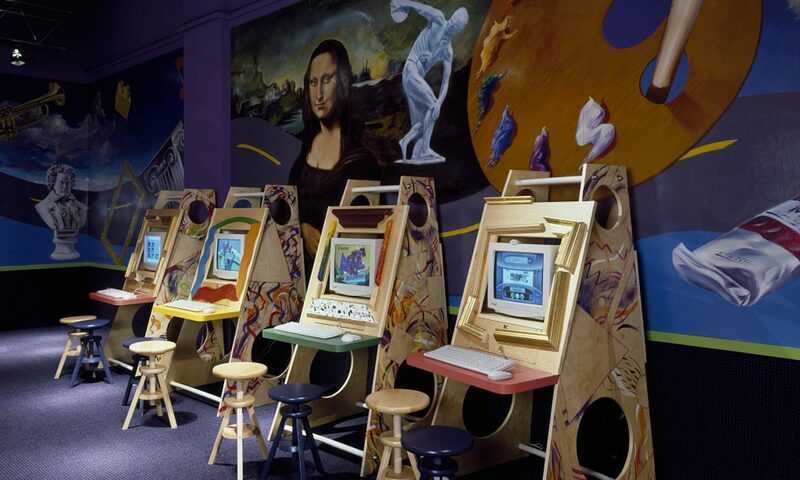 Using flash, these games create basic platforms for engaging children with familiar aspects of Chicago history and culture (the fire, the flag, the skyline, the World’s Fair, etc.). None of the “About Us” information provides a hard date for when it was created and the targeted age range of 6 to 12 years seems a little high given the simplicity of the games and the sophistication of digital natives today, but it does seem like a cute attempt to expose kids to history and artifacts related to the Swamp City. Then again, I played around with the games for longer than I care to admit. You’ll also see the familiar guidepost beckoning to teachers in the upper right hand corner that we have discussed so often in class. Tangentially, it has been interesting to watch this organization evolve over the years. When I was in high school, annual participation in the History Fair was mandatory and local topics were king, so I spent many afternoons filling out resource request slips (how analog! ), sheepishly pushing my school ID over the high counter to the authoritarian reference librarian (eerily similar, at least in my imagination, to how Santa looked in A Christmas Story), and being terrified to sneeze too loudly in their formal archive reading rooms. It seems they’ve finally turned a corner toward public history initiatives. With their new name and novel focus on more numerous curated exhibits, a film series, and even an on-site cafe, they present a much more welcoming face to general audiences interested in Chicago history. I did not play many video games growing up, save for when my brother let me join in some Mario Kart or Goldeneye. And though we have not gotten to the point in the semester where video games are on the agenda, just the concept of video games as part of digital history struck me a few weeks ago. So in brainstorming and trying to find a print project that would not only reflect our lessons in Digital History but would also relate to me on a personal level, suddenly Carmen Sandiego popped into my head. Now I’m sure others have seen the television show, but what I would propose for my print project is doing an historical analysis of the computer game “Where in Time is Carmen Sandiego?” Later in the semester, several historical internet games will be demonstrated. This Carmen Sandiego game, which I did play as a child, falls into a similar category as “The Jamestown Experiment” or “Cotton Millionaire”, especially as it has a direct correlation with history. “Where in Time is Carmen Sandiego?” has various chronological levels (“missions”), marking specific periods in world history. The game provides guides such as “Anne Tiquity” to help the player search for clues, talk to other characters, and interact with the level to find where Carmen’s henchmen are hiding. While this game undoubtedly influenced my interest in history and bolstered my knowledge of random and at times useless facts, what appeals to me in this print project is analyzing how exactly the game is organized and constructed. Specifically, this Carmen Sandiego game interacts with historiography and memory in fundamental ways. On a superficial level, I would analyze what historical moments and peoples were chosen to represent specific eras in the past. For instance, the player jumps from Mali in 1324 as Mansa Musa is preparing for Hajj to 1454 with the invention of Gutenberg’s printing press. In each level, the various “tasks” a player must accomplish (such as matching corresponding kimono colors to the seasons in Japan, circa 1015) hold specific historical meaning for what was deemed representative of that particular society. On a deeper historical level, I would also like to analyze the application of race, gender, and stereotypes in the characterizations of the people and descriptions of the environment in the missions. The missions take the player to the United States, Europe, Africa, the Middle East, and Asia. Though one could claim the game to be representative, other elements in the layers of the game may reveal a Western bias, racist stereotypes, or an imbalance of gender ratios. Who are the female historical characters being depicted? Who are the “non-white” males? How do their characters speak and how is the tone of their voice? The wording of their answers? Despite the fact “Where in Time is Carmen Sandiego” gives the appearance of being unbiased, a closer analysis of the game may reveal much different results. Furthermore, I would seek to answer questions relating to topics we have discussed in class, such as accessibility and the democratization of history online (or in game form). What children are playing this game? What repercussions might it have on their historical worldview? What are the pros and cons of the existence of such a game? What is valued as “history” in this game, and do children notice that and accept it? In addition to my love for this game as a child, I believe this sort of analysis in a print project could yield an important understanding of the way historical memory is transferred between generations. 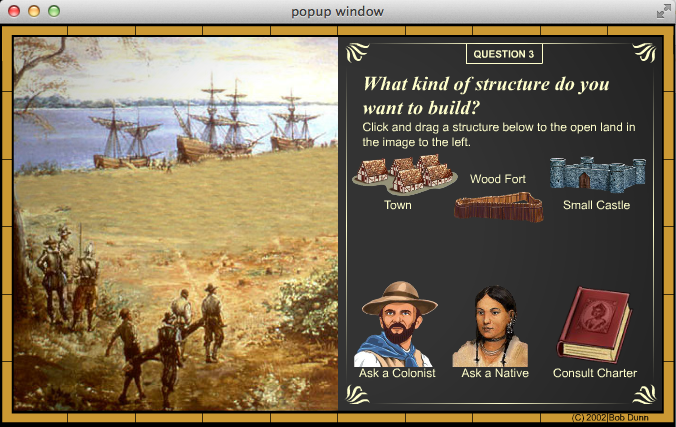 Children learn American and world history in their schools, yet supplemental materials such as this game have a drastic impact on their concept of history as well.